Curiosity Cottage: Nature and life progress in such a lovely way! Nature and life progress in such a lovely way! This INCREDIBLE weather we are enjoying is perfect for getting outside and taking pictures!! The hydrangea is one of my FAVORITE flowers and I planted quite a few last summer. These pictures just seemed to be destined to become a collage!! That is what is so amazing about the blog world, photos are so important regardless of the topic that one chooses to write about. Finding free software to use that enables me to add everything from frames to special effects to my pictures turns the process of getting things ready for my blog post in to an entirely new art project! 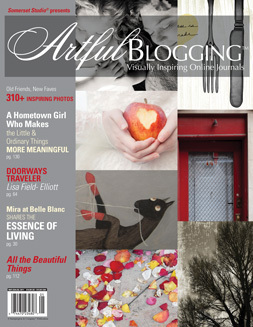 As I am preparing my new course on blogging, I have taken the opportunity to show some of my students the magazine Artful Blogging. The reaction each time is "wow, I did not know you could do that with blogs." That is what is so exciting about this project geared toward academia!! It gives me the opportunity to show students how they can combine their creative sides with their academic sides using computer skills. Yes, blogs can be a lot of work, but it is fun and free!! :D This course will also give me the opportunity to show my students that they can take something that they love and turn it into something incredible!!! For some this may be a little business, but since I teach at a Christian liberal arts college, if it very common for students and faculty to be very involved in mission work!! Blogs will give these students the opportunity to share with the world what their mission work is all about and can also be used to help them acquire financial assistance for their work. Since I love, love, love learning new things, this is one of my FAVORITE projects for the summer!! With summer break right around the corner for children everywhere, at some point most of us will hear at least one of our children say "I'm bored!!" What is so funny about this is that the older I get the more things that I find I enjoying doing. I do not have time to be bored!! :D Curiosity Cottage has given me the opportunity to totally embrace this side of my personality and in the process I am passing my love of learning and creating new things along to my children. My sons love helping me create things and come up with new ideas, which has really turned this into a family business and not just my business. For me orders are not work, but each order is a new art project and we all love seeing the final product when I am done. As Curiosity Cottage grows, the progression is like that of the hydrangea with each stage being a wonderful extension of the previous stage. I cannot wait until it is in full bloom, though I am not quite sure how I will even know when I have reached that stage. For now, I am just enjoying each stage of the process to the fullest and look so forward to the day I can share all that I am learning with my students!! Enjoy this GORGEOUS weather and your week! !